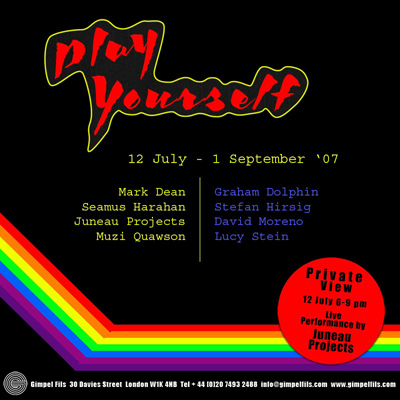 Play Yourself, was the mantra of jazz musician Charles Mingus who encouraged improvisation and a style of playing that would best express the musician's personality and mood. The works in this exhibition explore the ability of music to not only express our identities, but also how music is central to the formation and maintenance of those identities. Play Yourself is however an ambiguous phrase: at once encouraging, it is also challenging. Play yourself: express yourself. Play yourself: do it yourself. The variety of artworks included here encompass the multiplicities of the phrase with fascinating results. Song samples are repeated, remixed and replayed, to create new forms of visual and aural representations in Mark Dean's multiple screen DVD. The Band combines four unique performances and music genres to create a band that doesn't exist in reality. Three musicians of varying degrees of fame accompany fragments of their own previously-released material while a group of school children sing a verse from A Midsummer's Night Dream. The effect is magical and eerie as different generations use music as personal expression to different ends. The opening song to the Minutemen's LP What makes a man start a fire is the bass heavy Bob Dylan Wrote Propaganda Songs. Planned as a tribute to Dylan it is also a parody of Dylan's early lyrical style. This combination of affection and mimicry is echoed in Graham Dolphin's use of the Minutemen's album cover and his compulsive transferal of the cover design onto the vinyl disk itself. His work reminds us of the importance of the album sleeve notes and imagery to our understanding and appreciation of the music itself. Seamus Harahan's film references the urban environment. Filming marginal lives within Belfast city center, his work transforms the mundane into something much more poetic. Combining imagery of stray dogs and homeless men with an upbeat reggae soundtrack he suggests an alternative way of viewing the world around us. Images of a bird in flight bathed in dappled sunlight reminds us that cities have rhythms and soundtracks that are unique and which influence our perceptions of where we live. Stefan Hirsig utilizes a specific type of display system for his painting and collage work. An outer frame encloses the inner structure, creating a sensation that elements might break through the frame and complete the design of another painting. Colour, geometric pattern and imagery from 12 inch record covers are combined to create a dynamic field of energy that replicates the excitement and movement caused by pop music. Records by The Smiths and New Order become channels through which Hirsig produces his own dynamic means of covering and uncovering, dis-solving and fusing the world around us. Previous works by Juneau Projects have seen them destroy mobile phones, computers, camcorders, dictaphones and cd walkmans in order to make unexpected sounds and music. Juneau Projects will present a new sculpture and digital prints that illustrate their on-going investigations into the ambiguous relationship between nature and technology. On the one hand exploring the centrality of music to teenage identity, their work also points to how urban life is detrimentally distanced from nature. They frequently use characters and images of animals and birds to tell stories about how we think we feel about nature in the 21st century. Mellow vibes and music's role in meditation emanate from David Moreno's watercolour paintings. Our perception of sound is directly related to the physical and kinetic nature of both the sound source and the mechanism within our ears. These works not only provide a visual representation of the experience of listening to music in a physical way, Moreno's use of colour also suggests how music influences mood and atmosphere. For Muzi Quawson a chance meeting in Manhattan led to the creation of a body of work that combines the personal life story of a girl called Amanda, with the town of Woodstock in Upstate New York and its musical history. Quawson has photographed Amanda since 2002, charting the highs and lows of her life as musician, mother, lover, against the backdrop of a town that has become idealized in American popular history. How the legacy of the Woodstock festival in 1969 encroaches into the lives of its present day population becomes a fascinating component of a compelling set of images. Combining oil painting with collage, drawing and other materials such as hair, make up or cigarette butts, Lucy Stein creates figurative paintings and drawings depicting young women in chaotic and fantastic landscapes. With a dual interest in anxiety driven existentialism and the kitsch and provocative language of pop, Stein's images explore the boundaries of 21st Century feminism. Taking inspiration from Courtney Love, female identity is shown to be obsessive, contradictory and a lot of fun.